I recently visited a customer with a grubby Terrazzo tiled kitchen floor who lived in the Skyline Apartments in the centre of Manchester. Billed as luxury accommodation the building has a Gym and apparently a 20-metre swimming pool on the roof. 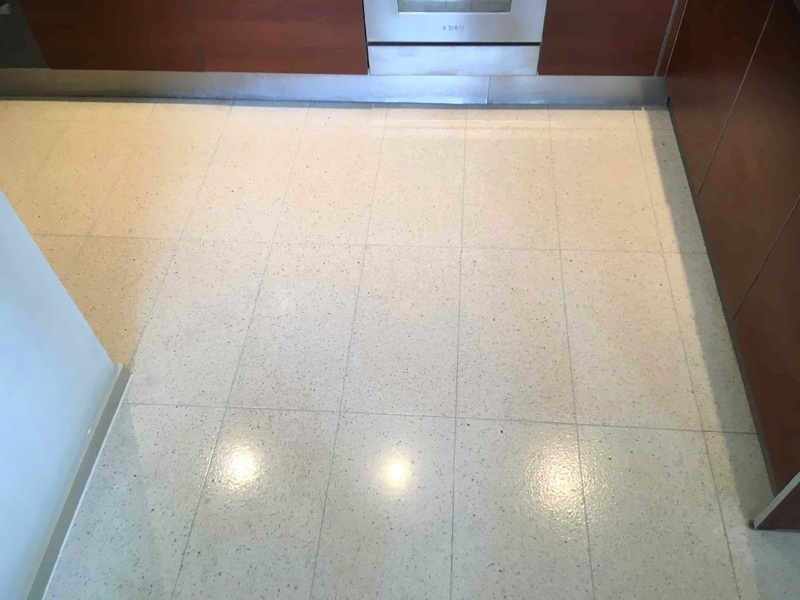 The floor in the Kitchen was around 6m square and my customer originally thought the tiles were Limestone, but I was able to confirm they were Terrazzo, not that it mattered from my point of view as the cleaning process would be the same. 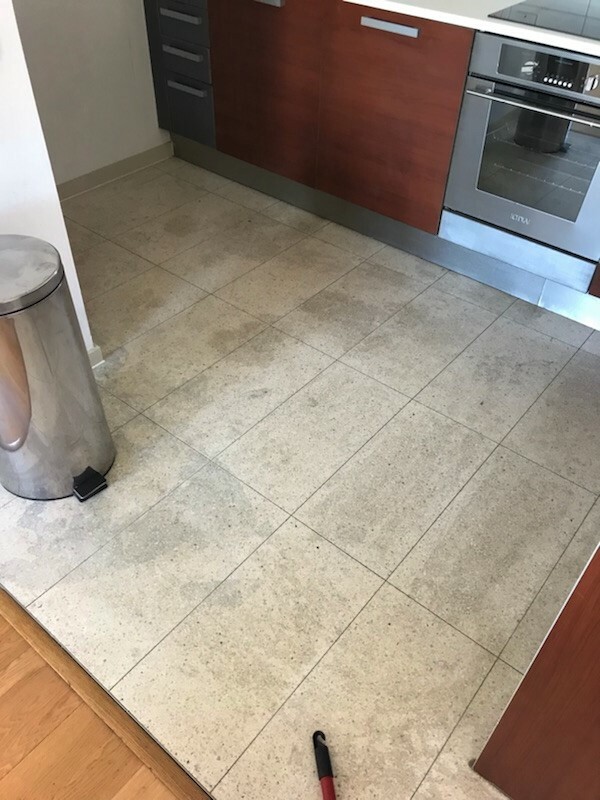 The previous owner of the apartment had never maintained the floor properly, so my customer inherited a very grubby Terrazzo floor and had tried getting rid of the dirt without much success. After running a few tests, I could see that that any protective sealer had long since failed and dirt was now ingrained in the pores of the tile. The tiles would now need to be burnished to restore the appearance and then sealed to protect it from ingrained dirt going forward. To get the floor clean and ensure what was left of the old sealer was removed I scrubbed a strong dilution of Tile Doctor Remove and Go into the tiles. This product works best if you leave it to dwell on the tile for around ten minutes before working it in. Afterwards the soiled product was removed using a wet vacuum which makes light work of extracting liquids from hard floors. To burnish the Terrazzo, I used a set of Tile Doctor Burnishing pads which are applied to the floor using a rotary floor buffer running a slow speed in sequence from coarse to very fine. Lubricated with water this process uses a coarse pad to cut back through the tile to remove marks and ingrained dirt. This is followed by the medium and fine pads rinsing the floor with water in between each pad and extracting the soil with a wet vacuum. The last pad which is a 3000-grit very fine pad is applied dry to the floor with only a little water sprayed onto the tile using a process we call a spray burnish. 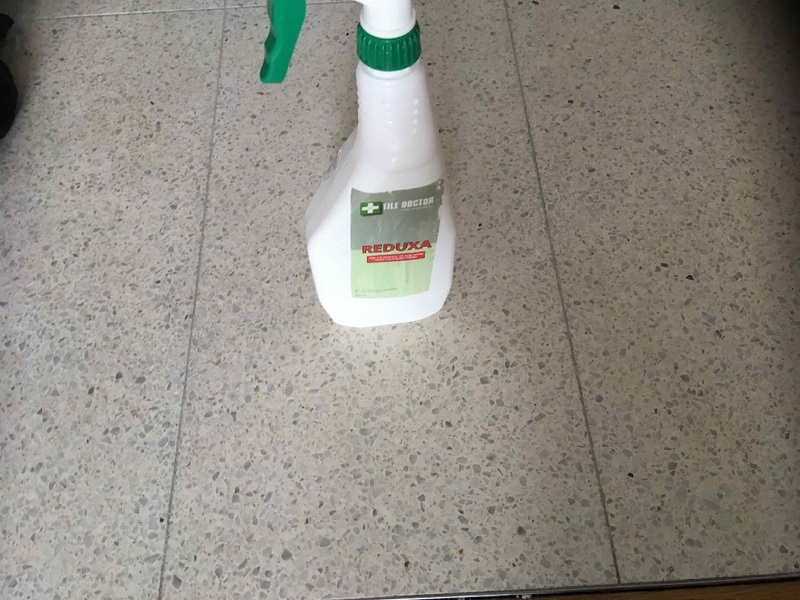 Being a kitchen there were a few deep stains in the floor which I was able to spot treat with Tile Doctor Reduxa which is an interesting product that is absorbed into the floor and then when heat is applied it evaporates lifting the stain out with it. To seal the Terrazzo, I used two coats of Tile Doctor Colour Grow which as the name suggest is a colour enhancing sealer. The product works by soaking into the tile occupying the pores so dirt cannot become ingrained there. 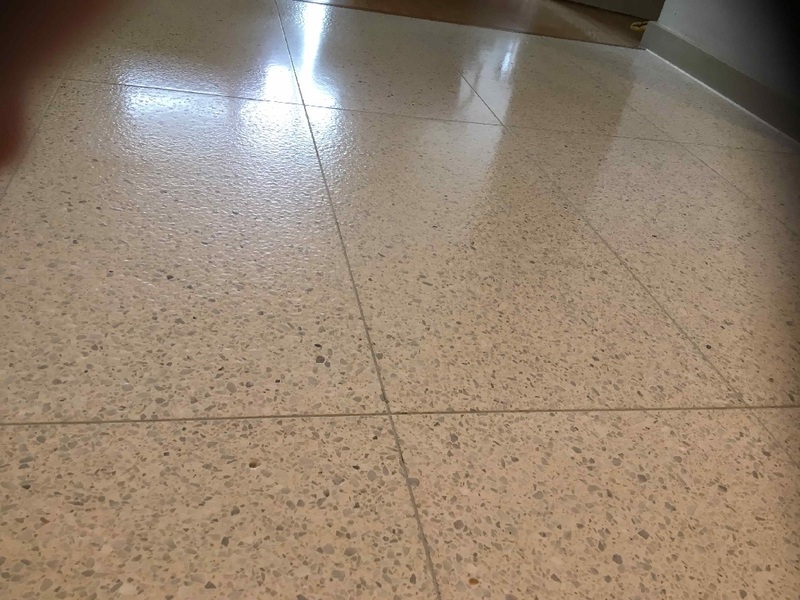 It added a lovely finish to the Terrazzo, enhancing its appearance and will make the floor much easier to keep clean going forward. The completed floor now looks clean and fresh and an amazing transformation considering how dirty the floor looked when I first arrived. My customer was very pleased with the improvement and left the following short comment on the Tile Doctor feedback system. Kamila is the best!! great job.